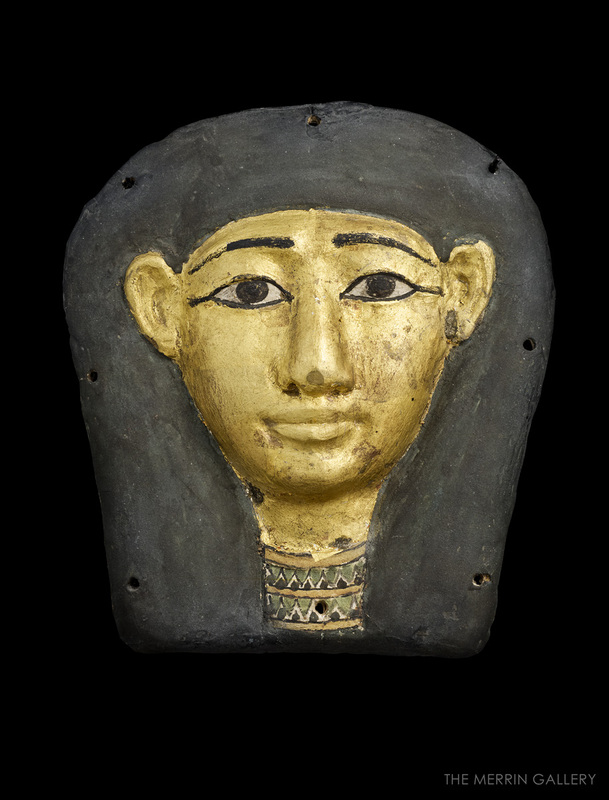 This beautiful mummy mask is the very picture of serenity. Gilded with gold, save for the eyes and black painted hair, it mirrors its larger counterparts in every particular. Each detail, from the kohl lined eyes to the double layered painted necklace, has been rendered with care to resemble the dead using a material known as cartonnage. Cartonnage is a lightweight material made from linen or papyrus soaked in plaster and shaped by hand. The material allowed for easy molding of the most delicate details of the face, from the shape of the nose to the inner folds of the ears. Mummy masks were traditionally crafted as part of a funerary sarcophagus. Given its size this mask was potentially used as a pectoral; the eight evenly spaced perforations around the edge would have allowed the use of a cord to bind it the mummy. The Late Period of Egypt, during which this mask was crafted, is widely regarded as having been the last great era of Ancient Egypt. While outside of Egyptian borders empires rose and fell, pharaohs of this period continued to rule under the guise of a nation unchanged since the days of the great pyramid builders two thousand years before.